Defending champion Rupert Green took home the Bob Marley trophy for the men's marathon for the fourth consecutive year at the 12th staging of the event. Spain's Pilar Isidro lifted the Rita Marley trophy for women. Over 1400 participants from 36 countries attended. Race director Alfred Francis said: "This was our biggest and best year yet and we must say a big thank you to the Jamaica Hotel and Tourist Association and the Negril community, The world already knows what Jamaica can do in sprinting, but Reggae Marathon shows that we are expanding our reach and becoming a true running powerhouse." Hosted by the Jamdammers Running Club of Kingston, Reggae Marathon has become an international favourite with a world-renowned Pasta Party and non-stop reggae music as the signature on-course entertainment. Japan-based Joseph Gitau ran the sixth fastest time ever in Fukuoka writes Ken Nakamura. Pre-race co-favourites Haile Gebrselassie and Martin Mathathi both dropped out. 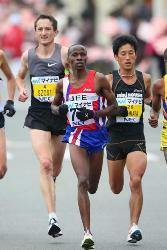 It was Gitau's third Marathon start after dropping out on his debut in the 2009 Fukuoka Marathon. Gitau followed Henryk Szost's surge at 33km and soon took over the lead, returning the fastest splits of the race in the later stages: 30–35km in 14:54 and 35–40km in 14:41. Gebrselassie dropped out at 32km and Mathathi at 38km. Hiroyuki Horibata, who surged into the front at 30km after the pace makers dropped out, came back for second place but missed the 2:08:00 for automatic selection for the 2013 World Championships Marathon team. Ryan Vail, who was originally scheduled to run the New York Marathon a month ago, finished seventh and improved his personal best by a minute. Due to a wrong turning taken very early in the race many runners ran more than the correct distance in both half Marathon and Marathon. The leading runners in the Marathon may have run up to 3km further than the Marathon distance. Atsedu Tesfaye went one better than last year to win this year's 57th editon writes Norrie Williamson. "It was very hot compared with last year," said the Ethiopian who was runner up to Zerzenay Tadesse last year. Over 1000 runners started in 30°C and 72% humidity. Vast numbers of spectators lined the entire route from the City Hall to the Stadium at the waterfront. The race is the largest and oldest in Angola. With a total purse of over $1450.00 USD, $150.00 USD for first place and awards for the top 20 men and 15 women it is one of the richest and most fiercely contested 10km races on the continent. The event has been held every year since its inception in 1954 with the exceptions of 1961 and 1978.